We track market on a daily basis and we adjust our planning according to the market movement. It is very vital for traders to adapt and react to changes.We have prioritized group that gets our first hand info on trading. If you are interested, please drop us an email at futures.coin@gmail.com for further detail. On the other hand, please follow us at our blog http://futurescoin.blogspot.com/ as posting will be early in our blog than I3investor. If you like what we are doing, kindly like and share our page at FB. Follow us at FB for more updates. Gold edged higher on Tuesday, supported by a retreat in the dollar after an apparent breakthrough in Brexit negotiations between the European Union and Britain, although rallying equities capped bullion's gains. To subscribe to real time signal, email to us at futures.coin@gmail.com for details. Sign up today for March subscription. The S&P 500 and the Nasdaq rose on Tuesday after tame inflation data underscored the Federal Reserve’s dovish stance on interest rate hikes, but the Dow ended lower as Boeing’s shares sank for a second day after one of its planes crashed in Ethiopia. The Hong Kong stock market closed higher on Tuesday, supported by sentiments in global markets and as Beijing and Washington appeared to progress towards a trade deal. 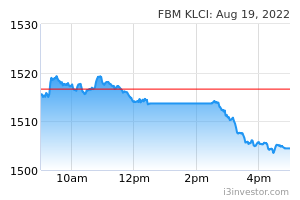 FKLI rebounded to 1674 as the regional markets were being stimulated by the surge in the overnight Dow. The market was said to stamp its foot firm above 1664 for the whole day and if it to be sustained today, the market may have more room to continue going up. FCPO tumbled to 2090's first session today and looks like it is continuing its journey to the South. Dalian and soybean oil are weak today while Ringgit stays at RM4.08 against the greenback. Plan A : Sell if market failed to support above 2093. Targets are 2078 and 2066. Plan B : Buy only if market held firm above 2093. Targets are 2105 and 2119. Plan C : Above 2103, no fresh position. Plan D : Below 2083, no fresh position. Disclaimer: This information is intended to assist professional investors. News are credit courtesy of Reuters and CNBC. The information does not constitute investment advice or an offer to invest or to provide management services and is subject to correction, completion and amendment without notice.As with all investments, there are associated risks and you could lose money investing. Prior to making any investment, a prospective investor should consult with its own investment, accounting, legal and tax advisers to evaluate independently the risks, consequences and suitability of that investment.